Daleks, and Klingons, and Cybermen! Oh, my! 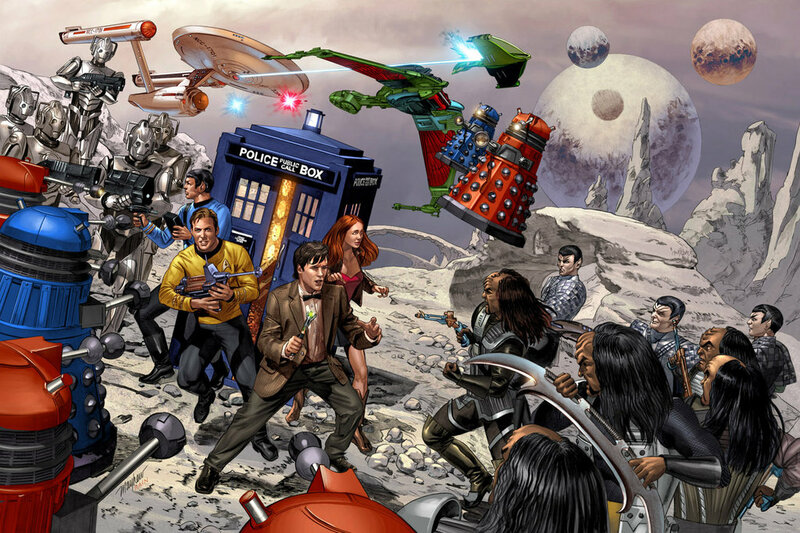 This insanely cool Star Trek and Doctor Who mash-up was done for Wizard Magazine by Mike Mayhew and Rain Beredo. Click the image to enlarge. So you gotta ask yourself, is this just an awesome image, or is this the beginning of some terrible fan fiction? Assume for a moment that it’s a story, it goes without saying that Kirk would make out with Amy. Would it then become “slash fiction”, or is that just so obvious that it’s not a problem? My thanks to Ed from THE UNIQUE GEEK listserv for directing me to this image. Check out Mike Mayhew’s deviantART page by clicking here. Visit Rain Beredo’s deviantART page by clicking here. The “slash” combinations are so many and varied here that it makes my little geeky brain leak out my ears. And of course the inevitable Cyberman-Borg War. “You will be assimilated.” You will be upgraded.” Lather rinse repeat. (B) If Kirk, even lean, mean and still-has-hair 1960’s Kirk, tried hitting on Amy she’d probably burst out laughing and mistake him for Zap Branigan.